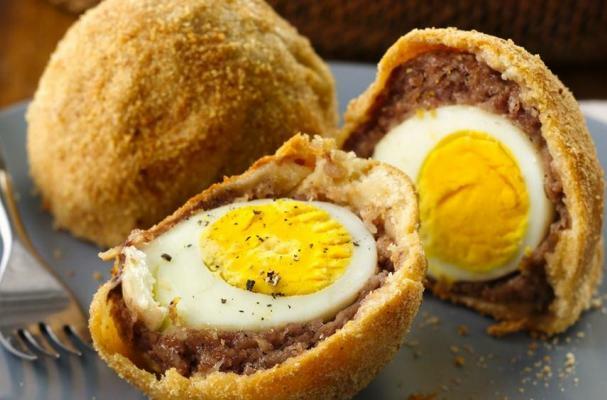 Crescent wrapped scotch eggs is a twist on this English dish. Pork sausage surrounds a hard boiled egg and then is wrapped in buttery crescent roll dough. Instead of being deep fried, these delicious pockets of pork and egg goodness are baked. These scotch eggs are great to serve for brunch because you can make eight portions at once. Heat oven to 375°F. Lightly spray cookie sheet with cooking spray. Divide sausage into 8 equal portions. Shape one portion of sausage around each egg, covering completely; coat with bread crumbs. Cut dough into 8 rectangles. Press each rectangle to form 4-inch square (if using crescent roll dough, firmly press perforations to seal). Place 1 sausage-wrapped egg on each square; wrap dough around sausage, stretching gently to avoid tearing. Pinch edges to seal. Spray each with cooking spray; coat with bread crumbs to cover completely. Place on cookie sheet. Bake 20 to 25 minutes or until light golden brown. Let stand 5 minutes before serving. Serve warm.